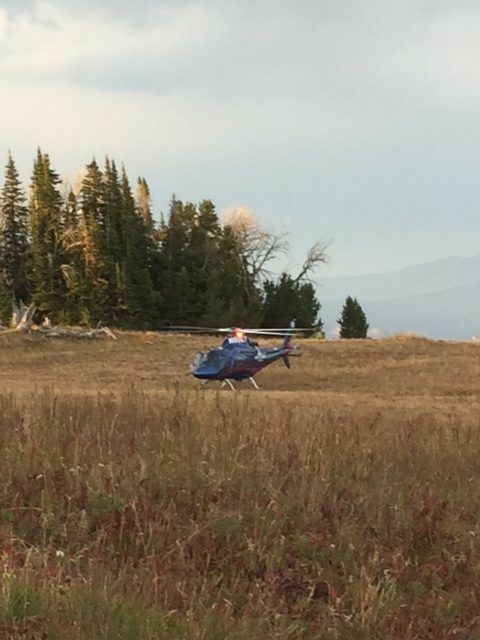 A Life Flight Network helicopter responds to transport an injured bow hunter from the Big Sky area to Bozeman Health Deaconess Hospital on Thursday. A bow hunter was impaled in the leg by an arrow in an accident south of Big Sky on Thursday afternoon. According to the Gallatin County Sheriff’s Office, at about 4 p.m. Thursday, dispatch received a report of an injured bow hunter on Buck Ridge. The 61-year-old Indiana man had fallen down a steep hill while hunting. During the fall, one of his arrows came loose from his quiver, impaling him in the upper right thigh. The arrow was removed and one of his hunting partners applied a compression bandage. Too bad it didn’t end up sticking him in his brain (such as it is). Now that would be a hard target to hit.